We’re having a bit of sun today and I’m appreciating it for all it’s worth because after the wind storms we had last week we’ve been put on notice by Mother Nature that autumn will quickly lapse into winter soon. I could feel it in my bones and joints that the high winds were coming and thought I took appropriate steps to secure everything growing on the balcony. I even strapped bungee cords around the largest plants and attached it to the balcony railings but I put too many together in a bunch and there was a bit of damage. One of the larger tomato plants lost a couple of branches. One was full of fairly ripe tomatoes that fell off easily because of it’s poor supported weight. The other branch had some smaller green tomatoes which I’m ripening in a wooden box in the kitchen stored under a cabinet. I did this last year when I was less prepared for the late September winds and had a few dozen smallish, green tomatoes. Since I was stuck indoors because of the weather I kept looking at the sofa and something about it was bothering me. I was happy with the patchwok pillows, and little bolster cushions but the arm caps just looked so plain and not blending in as much with the throw as I had imagined. Also, there was too much green and not enough of the terracotta, rust, apricot colours that I wanted to tone into it all. So I got out my Phildar Cotton 3 yarns and a needle and hook and gave them a trim that they deserved. The arm covers are reversible with the green side being more for the summer and the flower side more for the winter. I did a blanket stich around to start with followed by a couple of rows of single crochet in the dark green (Golf])) and then followed up with a row of classic “v”stiches in the terracotta colour (Acajou) , another "v"stitch row in apricot (Corail) and then finally a scallopy row alternating single, hdc , dc, and trc in the minty green (Jade) colour which I made up as I went along. I didn’t stop there, I also did the flowery pillows, too. I left the dark green out on those as they didn’t need such a wide trim. I took off the white afghan on the seat of the sofa and unfolded my latest big project to show more of it. And here below if the final finished look for my summery sofa. I know it’s a bit late in the season but I’m looking forward to the fun of putting it back on again in April or May when it’s time for a change to lighter fabrics. As you can tell, I’m having a love affair with green right now. I used to prefer blues over greens but I seemed to have evolved to appreciate green and want to have it around me. I’m content with it now and am working on the finishing touches to the covers on my “throne” aka the very comfy Ikea recliner chair. I’ve run out of yarn and have order from a new-to-me shop online and hope to have it within the next couple of days. That chair is where I spend most of my life I think! The sofa is most usually occupied by Mr. (not) Busy Hands who likes to stretch out on it for snoozes and tv watching in typical Couch Potato mode. 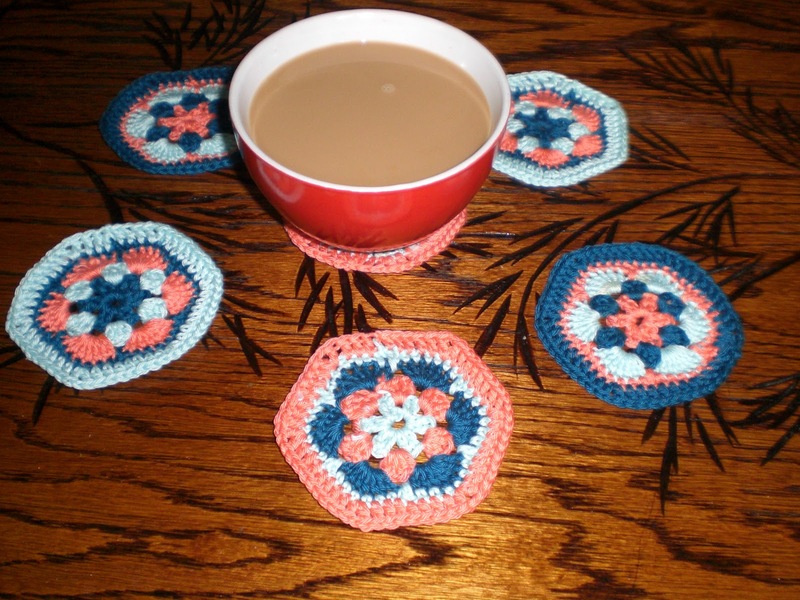 Also, I made some coasters to go with my colour scheme. I used an African flower motif that I have in a book but made my own by making a couple of changes. So there you have it, the finished (at long last) results of my sofa's summer look. As I’m composing this post I’m looking out the winter and taking in the colour changes of the leaves. I love those colours of reds, browns, yellows and greens and am getting ideas. Now, on to the winter look ………!